YOUR OPEN MATTRESS IS AN INVESTMENT IN YOUR WELL-BEING. THE OPEN MATTRESS PROTECTOR WILL PROTECT YOUR MATTRESS, THE SAME WAY YOUR OPEN MATTRESS PROTECTS YOU. 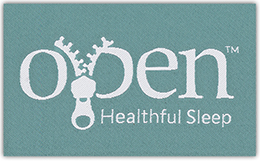 THE MATTRESS PROTECTOR BY OPEN PROVIDES NATURAL, BREATHABLE PROTECTION FOR YOUR MATTRESS WHILE PRESERVING THE FEEL AND PERFORMANCE OF ITS SURFACE. Our organic shrink-to-fit, washable mattress protector is specially designed to provide efficient pressure point relief, reduced surface tension, bunching and shifting for a deeper and more restorative sleep. As on all of our mattresses and bed components, the stretch-cotton in our Mattress Protector is certified free of harmful chemicals by Oeko-Tex Standard 100. It is made from the same soft organic cotton used in the cover of our mattresses and pillow tops. Fitted Design for a perfect fit and reduced surface tension.